First, thanks to Cheryl for last week’s blog. I’ve got a copy of Vengeance Is Mine waiting for me and I’m really looking forward to reading it this weekend! I will, of course, report back and let you know what I thought about it. One of the modules in our course deals with writing readers’ letters to magazines and newspapers, and ‘filler’ items. These days ‘fillers’ can be quite difficult to put your finger on as they can range from short articles and tips on travel, food or money-saving through to quizzes and humorous anecdotes. Some students complain that working in this market isn’t ‘real writing’. It may not seem like it, but it can certainly bring in a bit of extra money – not to mention the enticing free gifts that various publications offer in lieu of cash. I’ve spotted three recently that are definitely worth considering. The Sun is currently offering £50 for the star letter of the day. Even if you’re not a Sun reader it might be worth browsing a few issues to see if you feel you’ve anything to contribute to the ongoing debate. Email to letters@thesun.co.uk. Saga Magazine also offers £50 per issue for the star letter. Send your comments to editor@saga.co.uk. Finally, letters published in Wetherspoon News (a free quarterly) each receive a £20 gift card. And I’ll say it again – it’s not about whether you enjoy the contents of the magazines/newspapers you are writing for. If you want to earn a decent living as a freelance writer you need to be able to adapt your style, interests and research in order to get your ideas into print/online. Our 2019 Short Story Competition has now closed and we’re sifting through the entries. I’ve only seen about half of them so far, but they’re looking interesting! As soon as we have the shortlist we’ll let you know. So, keep checking our website for the first announcement. The Big Issue Crime Writing Competition 2019 is accepting entries until 31st May. The prize is a two- book publishing deal with Avon, a division of HarperCollins. They want to see a synopsis (no more than 100 words) the full manuscript and your contact details. This must be sent to avonsubmissions@harpercollins.co.uk with ‘Big Issue Writing Competition’ in the subject line. 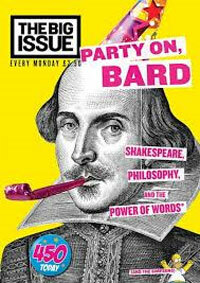 Full entry details are available on the Big Issue website. And finally, with something for everyone, The Yeovil Literary Prize. There are prizes for novels, short stories and poems. They even have a ‘Writing Without Restrictions’ category (they say ‘You write it, we’ll read it”!) and there is a special prize for a shortlisted entry by an author living in the Western Gazette distribution area. Prizes and entry fees for each genre do tend to vary so check out the website for details. The closing date is 31st May, so you’ve still plenty of time to enter. This entry was posted on Friday, April 5th, 2019 at 9:00 am	and is filed under Competitions, readers' letters. You can follow any responses to this entry through the RSS 2.0 feed. Both comments and pings are currently closed.